While diving into my research on theaters in Klamath Falls, Oregon during the 1905-1910 time period, I came across the Houston Opera House and learned some interesting information worth sharing.The Houston Opera House was originally purchased in 1897 by John V. Houston, a man who moved with his family from Colorado in 1894. 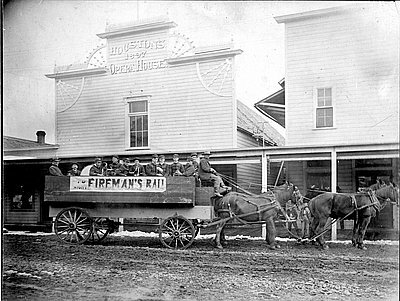 When the original Houston Opera House was purchased, it was described as a vacant two-story building on Main Street near Second Avenue in Klamath Falls. Houston was said to have added a brightly painted wooden façade and a large stage inside. John V. Houston and his brother, J. A. Houston, named this building the Houston Opera House to honor their father, who had loaned them the funds to get started. The original Houston Opera House, “…Quickly became the city’s cultural center, with community dances, costumed balls, club meetings, concerts, basketball games, and even church services on Sundays” (Oregon Encyclopedia). 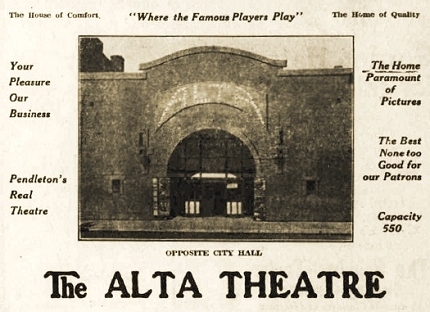 In 1908, The Houston Opera House was renovated and became the only modern theater in Klamath Falls. These renovations included its ‘auditorium being fitted with 32 private box chairs, a horse shoe gallery to seat 250 people, folding seat chairs along the new scenery, drops, and flaps. After researching The Houston Opera House, I came across information that stated the theater burned down twenty-six years after its purchase. A piece of research I discovered that I found most peculiar came from the Herald Newspaper. 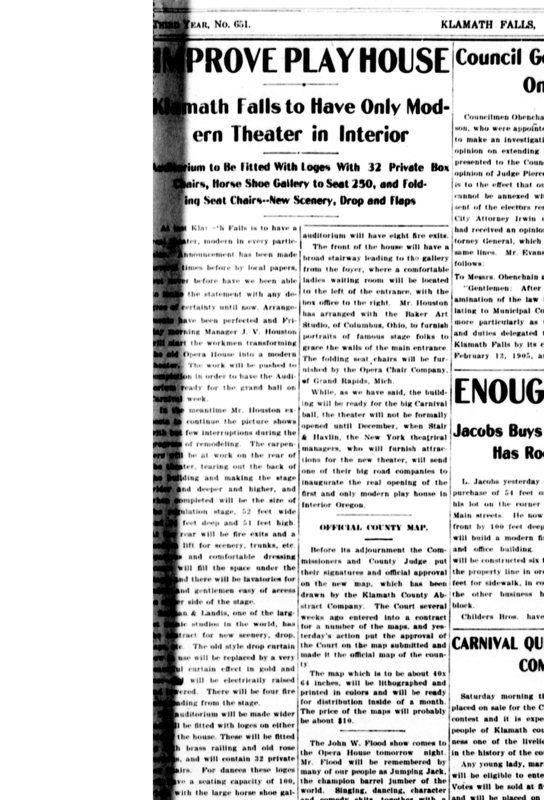 In the Wednesday newspaper on September 9, 1908, an article discusses how the newly renovated Houston Opera House will have eight new fire exits. Aside from advertising how the newly improved Opera House is the only modern theater in Klamath Falls, the theater uses its incorporation of more fire exits as a way to persuade people to come to the theater. While it is ironic that approximately 12 years later the Houston Opera House burned down, I became fascinated with trying to understand why discussing fire exits in a newspaper was seen as an advertising tactic for the theater. After researching fires near Klamath Falls during this time period, I discovered that forest fires were very prevalent during 1908. Just five days before the newspaper regarding the innovations to The Houston Opera House was published, The Evening Herald wrote an article regarding raging forest fires at Yamsay Mountain that had been active for weeks and were making their way toward Klamath Falls. Perhaps incorporating the increase of fire exits in the theater made people during this time feel safe and more comfortable with being ‘stuck’ in a theater for specific durations of time. All in all, I found this discovery to be interesting and insightful as it helped me to understand why fire exits were seen as an important promotional strategy. The “ad” for a theater that I have chosen to analyze today will actually create more questions than answers about the particular theater, setting, and the politics related with such. 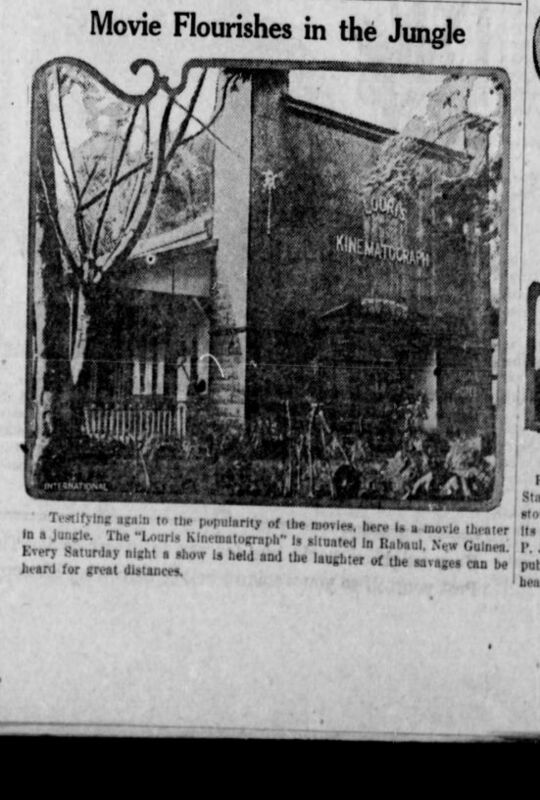 In the September 24th, 1920 Issue of Independence, Oregon’s “The Polk County Post”, included is a photo of a moving picture theater located in Rabaul, New Guinea. The title of the theater is is “Louris Kinematograph”, and why the theater was constructed as well as for what purpose it was included in this particular paper are inquiries worth pursuing. We are given essentially no context for why this snippet was printed. The most likely case is that there was room on the page that they needed to fill and this sounded like an interesting, maybe “exotic” (exotic in a racist sense, as evidenced by the final sentence of the caption) tidbit to print. Interestingly, the first sentence of the caption sheds light on the relevance of film in society in general for that time with “Testifying again to the popularity of the movies…”. This implies that moving pictures were so socially relevant at the time, that the fact that this seemingly non-sequitur-esque snippet was included was inherently contextual in that movies were in the forefront of most people’s minds at that time. The theater itself is, as much as we can discern from the photo, in an area lush with vegetation, which apparently gave the editor the freedom to imply that the theater is located in the wilderness, despite the fact that this is not the case in all likelihood. The caption tells us that the theater plays shows every Saturday night. As we have learned so far in class, movie theaters ironically used to be more multifaceted in their utilization than they are presently. Often theaters were the sites of social activities, other forms of art/entertainment, etc., which leads to the question of: What was this space being utilized for when it wasn’t a Saturday night? Something else to investigate would be who was attending this theater. A quick Wikipedia search reveals that the area was captured by the British Empire during the 1910’s in a war-related acquisition. Could the venue have originally been constructed to provide troops entertainment on Saturday nights as opposed to catering to the Native population? What is revealing about this is the blatant racism on display in the final sentence of the caption. So flippantly referring to the people of Rabaul as “savages” puts into perspective how socially acceptable such mindsets were in the early 20th century, and compounded with Oregon’s ironically anti-progressive history with the treatment of minorities and non-Western peoples, it’s certainly worth taking note of. Overall, it’s fascinating how the history of moving picture exhibition can lead to such intersectional inquiries and discoveries. “Movie Flourishes in the Jungle”. The Polk County Post, 24, Sept 1920.